Our growth in IT and advanced manufacturing is a big driver in demand for clean energy. Tesla clearly put Nevada on the map in terms of dramatically changing our reputation after the recession, but the win that really got things started was bringing Apple to Reno in 2012, which, along with targeted incentives, started a data center boom. These facilities are very energy intensive and the tech companies want them to be powered by clean energy, which increases demand for renewables. Our data center tax abatements — which were established to make us more competitive with other states — have attracted Apple, Switch, Rackspace, and ViaWest to invest billions in Nevada. Nevada-born Switch is big success story. Switch Founder and CEO Rob Roy is on GOED’s board. Their headquarters is in Las Vegas. Switch is reshaping America’s Internet infrastructure with energy-efficient data center hubs located strategically throughout the United States, including Tahoe Reno, Las Vegas, Grand Rapids, Mich. and most recently Atlanta. 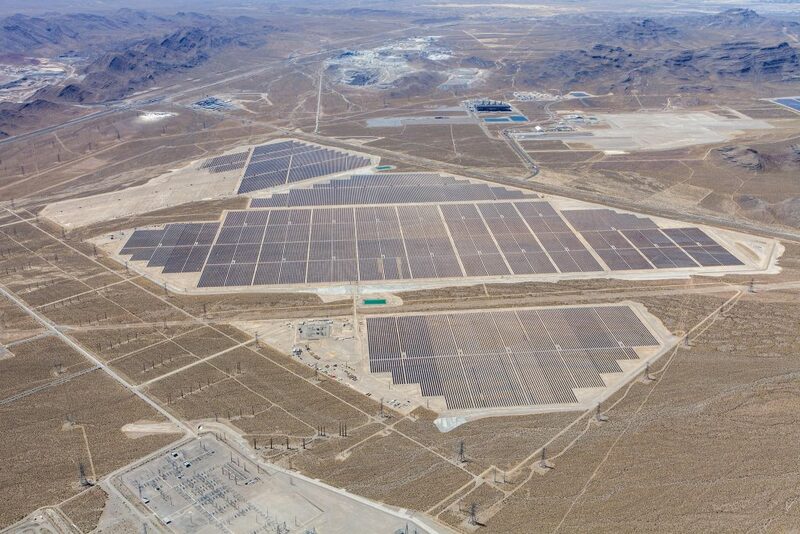 Switch uses 100 percent renewable energy for all of its operations and recently announced the Gigawatt 1 project, to be built in Northern and Southern Nevada, which will be the largest solar project in the United States. The project will produce among the lowest priced solar power in the world and generate enough clean energy to power nearly one million homes. Another big win for GOED early on was attracting Solar City’s regional headquarters to Las Vegas in 2013. Renewable energy projects have since taken off across the state. Pattern’s 150-megawatt Spring Valley wind farm, the state’s first utility-scale wind facility in operation, opened near the town of Ely in eastern Nevada. Ormat in Reno currently delivers more than 160 megawatts of geothermal power either to NV Energy or exports it to California. With $280 million of capital investment, 500 construction jobs, 120 permanent jobs and approximately 1,000 indirect jobs, Fulcrum Bioenergy’s Sierra Biofuels Plant located in Storey County is expected to process approximately 175,000 tons of MSW feedstock annually, creating 10.5 million gallons per year of renewable synthetic crude oil, or “syncrude,” that will be processed into transportation fuel. K2 Energy in Henderson is an American company and a leading researcher, developer and manufacturer of Lithium Ion batteries that are used in many advanced medical, transportation, and military applications around the world. Sempra Energy, one of the largest photovoltaic solar plants in America, is located in Boulder City and consists of nearly one million solar panels spread over 450 acres. And there’s SolarReserve’s 110-megawatt Crescent Dunes Solar Energy Facility project near Tonopah, which helps make Nevada the largest solar energy producer per capita in the nation. Nevada also encourages clean energy through incentives such as the Renewable Energy Tax Abatement Program (NRS 701A.300-450) administered by Governor’s Office of Energy (GOE). With an unparalleled digital infrastructure, low rating for natural disasters, and an abundance of traditional and green power sources, Nevada is emerging as an advanced center for information technology businesses. With excellent logistics infrastructure and just one day’s drive to Pacific Rim ports and more than 60 million consumers, manufacturing represents a dynamic and growing segment of Nevada’s economy. Nevada’s unparalleled mineral wealth continues to be an essential sector in the state’s economy thanks to world-class deposits of gold, silver, lithium and other resources. From diverse agriculture to abundant solar, wind and geothermal energy to a growing water tech community, Nevada is rich in natural resources and the expertise to manage them. With the star power of Las Vegas and spectacular natural settings, Nevada tourism and gaming are the industry standard and the center of global thought leadership for the sector.